FREE to good homes! Garlic...........and lots of it! As I was digging up the EWOs (see my post for FREE to good homes! Egyptian Walking Onions), I discovered I had fallen victim to my own absent mindedness yet again. So up comes part of the plethora of garlic that I carelessly tossed and has set up residence where I need to clear. Bad me! They have already sprouted and are using their stored food reserves, so I didn't do anything to them other than bundle them up and put the roots in moist peat for now. I do not know the specifics of this garlic, whether they are long or short day. I do remember buying them at Wallyworld and I live in zone 5, the skin has a purplish tint to it and it has a nice flavor to it. The bulbs I dug for use were about the size of a small pingpong ball, but probably would have been larger had I been more diligent with weeding and watering. 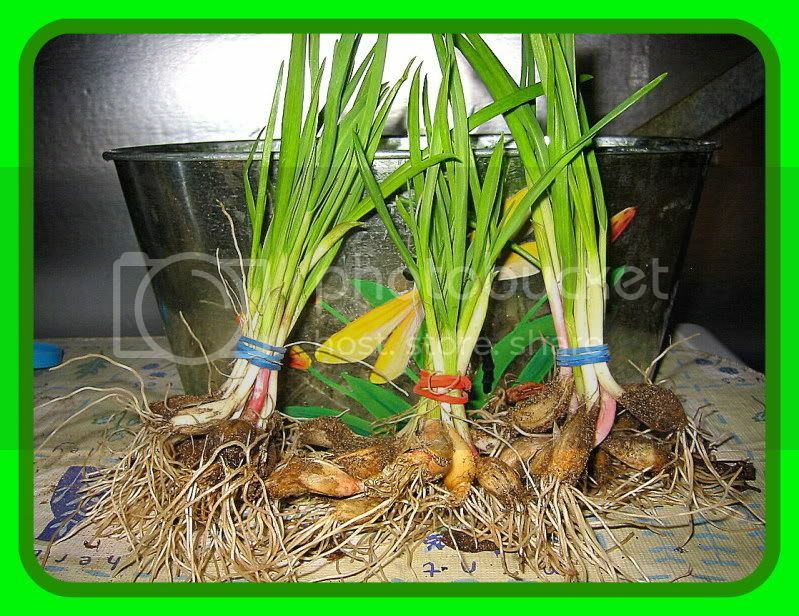 Each bundle contains 12 sprouted garlic cloves. I currently have 15 bundles, but I expect to have more since I didn't dig all of them up yet. First Class postage for 1 or 2 bundles (all that will fit in one of those large yellow clasp envelopes which is provided by me) is $2.00. If you are interested, PM me! I sexied up the picture with my Picasa update. Now my garage smells like an Italian restaurant! I'm always looking for new onions and garlic now I have to pick a nice spot to put them. Any idea on when to plant them? Lol ill have to eat one of each tho. Well if there a nice size. My friend across the street got some potatoes with red on the outside and inside and some purple /blue I put one of each in the corn beef and cabbage for st. Pat. He said if you were hungry I would have took you out to lunch. I said well don't you want to try what your going to grow and put work into? Pennies thru postal....they'd love you for that haha! Since these have already sprouted, get them in the ground right away. For my climate, we plant garlic in the fall so it's ready to go during the warmer months. They overwinter in ground under straw and snow, and when the temperature is just right they start sending up shoots. Spring planting isn't a problem, it just puts them a bit behind in maturity. But if you're in a warmer area that might not matter if you have a longer growing season than here in Z5. I hope you concealed the money well or it might not ever make it to her. Good point. Luckily I've never had anything scammed from a regular envelope. The thieves that work for the postal service are more interested in packages. I sold a book to someone on ebay and guess what was DELIVERED to her? An EMPTY package, torn up, not even taped back up. And the geniuses actually went through with the delivery after all that mess! I put a note in there also lol its bigger then money I think I folded the money also. Lol if it gets taken then ill send a $3 check and then another letter that looks just like money so when the postal people steal it again there will be a nice note for them inside.